Bothell, WA — AR Modular RF is pleased to announce that it's new AR-75 multi-band tactical communications amplifier has recently passed a series of EMC/EMI and environmental tests to certify it for use in the C-130 Avionics platform. The EMC/EMI 461F tests were CE106 Conducted Emissions Antenna Terminals, CS101 Conducted Susceptibility Power Leads, CE102 Conducted Emissions Power Leads, RE 102 Radiated Emissions and RS 103 Radiated Susceptibility. The Environmental Mil Std 810G tests included Methods 500.5 Proc I, II & III Altitude Testing; 511.5 Proc I Explosive Atmosphere Testing; 513.6 Proc III Sustained Acceleration Crash Hazard Testing; 514.6 Proc I Random Vibration 2 Wheeled Trailer; 514.6 Category 13 Propeller Air Transport. 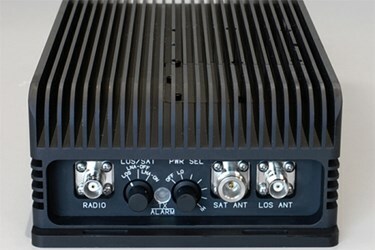 The passing of these certification tests further emphasizes the versatility and rugged design of the AR-75 product, which is a variant of the market leading AR-50 multi-band amplifier. These innovative amplifiers are designed for applications in ground vehicles, high performance SOF vessels such as Zodiacs and other rigid hull inflatables, drop and transportable communications packages, helicopters, Osprey CV-22 and now the C-130 avionics platform. For more information about AR Modular RF products and services, contact AR Modular RF, 21222 30th Dr. SE, Building C, Suite 200, Bothell, WA 98021, USA, 425-485-9000; or on the web at www.arworld.us.